Where Do the Political Terms Left and Right Come from? This split between liberty and authority and split between individualism and collectivism AKA “social equality and inequality” (or more generally between liberalism and conservatism; AKA “left” and “right”) has defined the political left and right since its first usage in the French press of the time. A simple way to see this is in terms of classical government types: The French Revolutionaries wanted a more liberal democracy (where both liberalism and democracy are the ideologies of liberty and equality) and that the aristocracy wanted a more aristocratic form of Monarchy (the ideology of hierarchies, order and authority). So those who want Democracy, Liberalism, Equality, and Liberty are “to the political left” of those who want Monarchy, Conservatism, Authority (Illiberality), Hierarchy (Inequality), Tradition, and Order. Today, the terms left and right still hold their original meaning, where the King is to the right of his aristocrats, who are to the right of the upper-class, who are to the right of the commoners; and where erring toward the liberty and right of the many is left, and where erring toward the authority of “the few” is right. The right-wing wanted to the traditional order and hierarchy, the left wanted liberty, equality, and a Declaration of Rights of Man and Citizen. The left got feisty and started rioting, the right came in with an army. Then eventually we get the liberal left-right emperor Napoleon arose… and thus the story also offers an immediate out-the-gate lesson on why the answer is balance, not EXTREMES. Although the terms aren’t always used consistently in practice, their core meaning has never changed. Monarchy and Democracy, Conservatism and Liberalism, Left and Right, Tories and Whigs, Federalists and Anti-Federalists, Populists and Elitists, and more all very generally speak to the same thing: a naturally occurring (in my opinion) aspect of the human condition manifesting as political dichotomies. See an essay on left-right spectrums. This is to say, The citizens who wanted democracy, individual liberty, and social equality stood to the left <—— of the President ——> and, the supporters of the Aristocracy, Monarchy, and King (“the few”) who wanted order, tradition, social hierarchy, and authority stood to the right. The above “left-right paradigm” doubles as a basic 2 point political spectrum. To simplify things:LEFT, LIBERAL, and DEMOCRACY is toward liberty and equality and RIGHT, CONSERVATIVE, and MONARCHY is toward order, tradition, social hierarchy, and authority (this is the basic original two-way split, in practice we want to consider liberty and equality separately rather than together because the social and classical forms of liberalism and conservatism are so different in-action). TIP: Leftism, like liberalism in general, can be seen as a pushback against the pyramid shaped social order seen in the “estates” of France of the time. TIP: See Left and Right: The Great Dichotomy Revisited for a more complete telling of the significance of the terms left and right. The opening chapter of the book describes the French origins of the terms in vital detail. The division between the left and right during the English, American, and French Revolutions tell us everything we need to know about the political left-wing and political right-wing as absolute and comparative terms. We can then apply this logic to any place and time to understand any unique political atmosphere in terms of left and right (for instance we can apply it to all historical and modern parties). Below we will explore how to understand the political left and right in historical context. TIP: We can look to Athens and Rome (or even earlier to Egypt) and find the origins of left-right ideology, but modern usage of the terms comes from the French Revolution of 1789; a liberal revolution of the people (the left). See a history of human rights for more discussion on liberalism since Athens. Aren’t the Terms Left and Right Subjective? While there is some room for subjectivity, when we consider history, the terms left and right are fairly objective and leave little room for debate as they accurately describe the origins of political factions in modern governments. The confusion comes from the fact that in reality politics are complex, and it takes a good deal of authority (right) to ensure social justice for the collective (left). Likewise, one might consider the freedom to own slaves as left, but the actual act of owning slaves (thus inhibiting the liberty of others) is very far-right. There are countless examples like this. TIP: For more reading see the birth of liberalism and the Age of Enlightenment or how to understand the political left-right spectrum. The simplest answer to “what do left and right mean?” historically speaking, is liberal is left (toward liberty and/or collectivism) and conservative is right (toward authority and/or individualism). As a comparative term left is always toward liberalism and liberty, and right is always toward conservatism and authority (from any given perspective). As an absolute term left means to the left of center (toward liberalism and liberty), and right means to the right of center (toward conservatism and authority). As a comparative term left is always toward liberalism and equality, and right is always toward conservatism and inequality (from any given perspective). As an absolute term left means to the left of center (toward liberalism and equality), and right means to the right of center (toward conservatism and inequality). 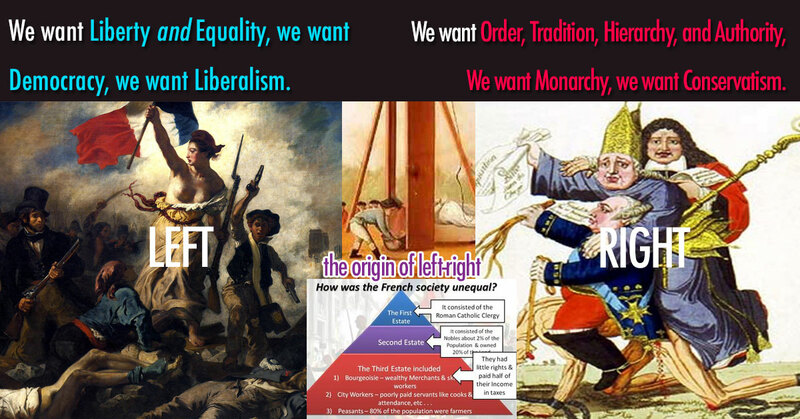 Comparing those liberty and equality paradigms at once adds complexity, but shows the two qualities that the democratically minded left-of-the-King in France were demanding (as we can confirm by their Rights of Man and Citizen more than their Jacobin Revolution… the Jacobin Revolution speaks more to Plato’s Democracy leading to Tyranny than the core of left-right). TIP: In other words, the Jacobin mob didn’t just want “liberty”, they also wanted “equality”. They wanted “Democracy” (the ideology of liberty and equality, as defined by Plato in 360 BC). With the above in mind, a democratic form of government will always be to the left, and a form of monarchy will always be to the right. If a democratic government acts as an authoritative tyrant (an “angry mob”, say a headless Jacobin mob) that behavior is right-wing (despite the left-wing ideals of the mob), if the monarch acts like a liberal monarch, as we can say Napoleon or the Enlightened Monarchs did, then that behavior can be labeled left-wing despite the right-wing authoritarian aspects. Or rather, in both cases their ideologies are mixed left-right in practice. This means a single entity can span a spectrum of left-right briefs and behaviors, but can always be described as being to the left or right of another entity. Thus, the terms left and right have historical and modern practical uses as they can be used to quickly describe how liberal or conservative a given party, ideology, action, or person is. TIP: See more discussions on left-right politics and the meaning of left and right. Enlightened Absolutism (Frederick the Great, Catherine the Great, Joseph II). What does a right-wing leftist (or left-wing right-winger) look like? Just ask Napoleon, the Jacobins, or Frederick the Great… or, let Tom Richey tell you about them rather. The political “left” and “right” were first used during the French Revolution of 1789 when members of the National Assembly divided into supporters of the king to the president’s right and supporters of the revolution to his left. One deputy, the Baron de Gauville, explained, “We began to recognize each other: those who were loyal to religion and the king took up positions to the right of the chair so as to avoid the shouts, oaths, and indecencies that enjoyed free rein in the opposing camp.” However, the Right opposed the seating arrangement because they believed that deputies should support private or general interests, but should not form factions or political parties. The contemporary press occasionally used the terms “left” and “right” to describe the opposing sides. This is notable, as shortly after the left completely took over France via revolution. We then see the rise of two notable far-left groups. The Girondins (including the sometimes American Thomas Paine) were intellectuals that, despite being far-left, were to the right of the “common men of action,” the more radical-left Jacobins. The Jacobins and Girondins initially teamed up to take out the right-wing (i.e. supporters of the monarchy), but by the start of the Jacobin Reign of Terror, things were sour. The far-left Jacobin Reign of Terror was spurred on by the assassination of the Jacobin political writer Jean-Paul Marat. This event snowballed. The Jacobins, led by Robespierre, feared retribution from the more right-wing groups including the Girondins. Some 25,000 – 40,000 French were killed in the reign of terror, mostly by beheading at the guillotine. The exact numbers appear to be 16,594 executed by guillotine (2,639 in Paris alone) and about 25,000 summary executions across France. The Jacobins kept accurate records as they always attempted to follow the law in their terror, so the guillotine numbers are probably fairly accurate. In this period if you weren’t far-left you were a traitor and were up against the Revolutionary Tribunal. Those executed included the early executions we all know from histories like Marie Antoinette and Louis XVI (who were right-wing monarchs), but also say those who believed in revolution but supported religion, those who spoke out against the far-left, or those who did or said anything the Committee of Public Safety disapproved of. Oddly, the Jacobins always followed the law and championed liberalism and enlightenment, so despite the far-right authoritative beheading and lynch mob aspect; they remained a far-left group in many respects. This story is important, as it not only displays an important time in political history, it also explains the roots of the political left and right, and clearly shows that those terms will always be able to be applied in a comparative and absolute sort of way. In sum, the Jacobins and Girondins were both far-left revolutionary factions. The main story of the revolution from about 1791 – July 1794, when the also left Thermidorian Reaction puts an end to Robespierre and the Jacobin Club, is a story of different degrees of right-wing behavior by the left. Thus, from the outset, we see we can use the terms left and right accurately, but the complexity of politics and human behavior often requires us to apply the terms in some comparative and absolute terms per entity or ideology. A Populist Rebellion and the execution of Peasants: Among people who were condemned by the revolutionary tribunals, about 8% were aristocrats, 6% clergy, 14% middle class, and 72% were workers or peasants accused of hoarding, evading the draft, desertion, or rebellion. Maximilien Robespierre, “frustrated with the progress of the revolution,” saw politics through a populist lens because “any institution which does not suppose the people good, and the magistrate corruptible, is evil.” – The French Revolution by David E.A. Coles (Amazon) p. 110 (see on Google Books). The passage also discusses the theory that the rebellion was secretly controlled by political and economic elites (hence what with all the leftist and peasant killing, but this line of thinking is often debunked and is another conversation, either way the story has much the same morals). Since the terms left and right began during the French Revolution, and since that Revolution came after the American Revolution 1765 – 1783, and long after the English Revolution of 1642 – 1651, and ended with the Glorious Revolution in 1688, we won’t dwell much on England and America. In England: The Tories are the right-wing conservative party who traditionally favor monarchy and aristocracy. The Whigs are the left-wing liberal party who traditionally favor liberty, parliament power, free trade, and the principles of enlightenment. The split in England is best felt first with the Petition of Rights and the English Civil War (AKA Revolution… unless you are from Scotland or Ireland) under Oliver Cromwell (a very right-wing liberal revolution), but the terms left and right aren’t used at this time. Later “the radical Whigs” will rebel against Burke’s old Whigs and formed a party that was farther left in England, which became Britain, or the United Kingdom, after being unified by Cromwell’s force. Oliver Cromwell and the English Civil War. Oddly, America’s first two factions, the Anti-Federalists, and Federalists, were both left-right in absolute terms. Anti-federalists like Jefferson were what today we would consider intellectuals in the Southern bloc of small government and small business. Issues of religion and slavery had no great importance yet. Federalists would be the equivalent of New York neo-liberals, leaning left on trade and social issues and to the right economic issues and authority. They wanted a central bank, shared debt, and more federal power. 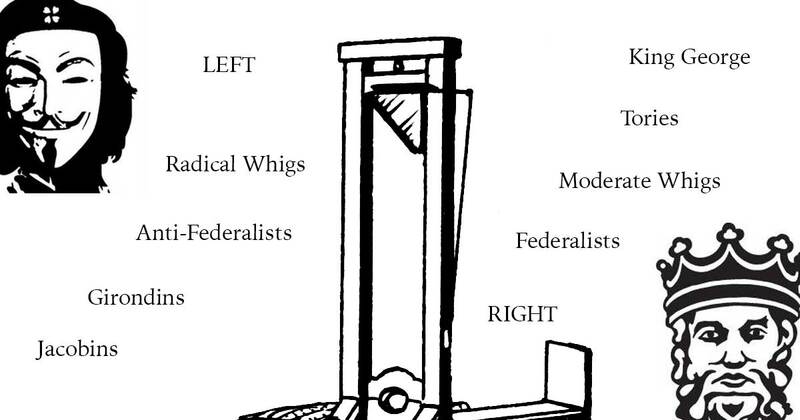 The anti-Federalists were like the French, and the Federalists were like the English Whigs. We find complex comparative and absolute usage of the terms left and right from the start. If we compare both parties to King George and the Tories, both the Federalists and Anti-Federalists are left-leaning, and George is right-leaning. This is why we say the American Revolution was a liberal revolution. Federalists vs Anti-Federalists in Five Minutes. FACT: The friends-with-everyone-from-Adam-Smith-to-Thomas-Paine Benjamin Franklin, the pro-French-revolution Thomas Jefferson, and anti-Burke Thomas Paine all helped spur on the French Revolution (and the American one, and almost another English one). Specifically, Thomas Jefferson’s Notes on the State of Virginia (1785) and Thomas Paine’s Rights of Man (1791) are both notable in respect to influencing political culture. Left and Right: The Great Dichotomy Revisited Edited by João Cardoso Rosas and Ana Rita Ferreira (NOTE: See introduction). The biggest load of crud I have read in a long time. The way these articles twist themselves, history and terms in order to move Hitler from the left wing of political ideology to the right ignored even the most basic understanding of political reason. Then the actual terms and there meaning are flipped on there head. Terms used in one way in Eupore and a different way in the US, terms that weren’t even in use in the US when they became standard terms in Eupore are then used to further confuse the terms allowing them to be twisted for a particular purpose. Liberal comes from the Latin meaning liberty. In this sense liberty means individual liberty. In order for there to be individual liberty in all the history of western culture, the individual must be the source from which everything flows, not the government. Conservatives in the late 1700’s through the 20th century referred to those who want to conserve the Monarchies of France, Austo Hungarian empires. By definition monarchies are for totalitarian forms of government and against liberty/liberalism. As Capitalism took root, mainly in the US, requiring individual liberty. Liberalism actually was the bases of the American Revolution, decades before capitalism took firm root. This spread to France and Eupore monarchies were in trouble. Conservative means to conserve or protect something, a way, a tradition. In the US the thing needing conserving was/is individual liberty. In Eupore it was the Monarchies. Therefore the same term used to label 2 groups of political thought at opposite ends of the political spectrum. That spectrum has on the extreme left total and complete control of all aspects of human life. All property belongs to the government, all means of production belong to and controlled by government. On the extreme right is no government, anarchy everyone for themselves. Monarchy, Socialism, Communism, Theocracy, Fascism are all left wing political ideologies. Hitler was NOT a Fascist. To claim he was is to completely ignore everything Hitler was and to totally ignore who the founder of Fascism is. Articles above claim that Hitler hated Socialism and Communism, leaving fascism the only remaining 20th century enemy in which to plug Hitler. However, Hitler was not a Fascist, he never ever referred to himself as anything over that a National Socialist. Yes he hated communism, the basic reason being that the objective of communism was a one world government operating under communism. Hitler was interested only in the advancement of Germany people, all other being inferior. Any ideology that was contrary to that end was a direct threat to his National Socialism. He was interested in aspects of Mussolini’ s Fascism. But Mussolini’s desire and his Fascist ideology was designed to recreate the Roman Empire. Bernie Sanders claims to be a Social Democrat in the Nordic model. Socialism is Socialism and by the nature of it designer must end up as communism. Not to mention Nordic Socialism has its roots firmly planted in German National Socialism. And therefore so does Sanders by his own words. Socialism by definition limits if not removed the property rights of indivduals. Without property rights there is no liberty. Hitler was a NATIONAL SOCIALIST period. And as such is firmly bound in the left wing of the political spectrum. On this there is no reasonable logical argument. As much as the left wants to place Hitler on the right in order to fit their political narrative they actions speak volumes as they are exactly like the NAZI party of the 1930’s. Really appreciate your views. I disagree with your conclusions, but we obviously both know our history and have interpreted the facts differently. The page above and our main page on left right politics explain our theory, which I stand by. I also stand by the fact that Hitler was a right wing socialist, a fascist. I explain my vantagepoint with citations below. Make sure to note how I consider left right to be two fold, the classical left which you call right (which contains anarchy, total liberty and equality, like Plato defined democracy) and the social left which favors social equality. These for me line up with real politics and I think it is the misunderstanding of this that leads people to want to say that social conservatism is classical liberal is right. In words, i have in my opinion correctly untwisted history, not twisted it. But the reader now has a counterpoint to consider and this is good! Digital democracy, oh classically liberal! That said, I will think hink more on your specific points and update the page as needed. This post is completely wrong. The French Revolution is – by all means- right wing in today’s views. The right and left is determined by Karl Marx’s work and not on “right or left side of the king in 1789”. The revolution stratagem and most important victory was by the burgeois and nowadays’ leftists are very far away from working burgeois and their ideologies. The aid the leftists gave to the human rights evolution was with the 2nd generation/dimension of human rights (the ones pertaining the search for equality). But 1st and 3rd are regarded as burgois and right-wing in the present time since they’re very pro-freedom which leads to punctual inequalities (which you’re fine with if you’re a right wing). Nowadays left wingers will have no problems taking away other people’s freedom to impose pseudo-equality under the penalties of law (a.k.a. special treatments to their kind). I get what you are saying, but I disagree and see the modern left and right as both being mixed ideologies that evolved from both the classical left and right. Classical left is classical liberal, it is what the left of the liberal revolutions were. Classical right is monarchs and aristocracies, it is what the liberal revolutionaries were rebelling against. Modern left and right are mish-mashes I think are well described as social liberal and social conservative. You are saying that since the social left wants government, they are the classical right. However this is only true on some issues, like welfare. Meanwhile, the social right wants their share of gods, guns, and government (gods and government being classical right), but they also wanted limited government when it suits them, for example on aspects of welfare. The modern forms are complex mixed forms, the classical forms are what they are. The idea that the left of yesterday is the right of today is overly simple and only applies to certain aspects of the modern right wing ideology like “I want liberty, but specifically only in certain cases like liberty of not having welfare and liberty of not paying taxes and liberty of owning guns” that is like the left saying “I want equality, but I will sacrifice some liberty to get this.” In both cases the modern left and right are sacrificing true and pure classical liberal left stances for their own ideological wants. Neither are purely classically left. Neither are purely classically right. I fully stand behind the theory above and believe it to fully correct. I think we are only confused by the modern mixed forms and our own desire to be on the side of the old heroes and not on the side of the old Kings. And if you think about it, that makes sense. After-all, the liberals one and gave birth to two modern factions of left and right within the sphere of the modern liberal state. By the way there’s no such thing as a “right wing socialist”. Because socialism is 100% left wing. Really, tell that the Richard Spencer and Hitler. How else can we describe a nationalist nativist right winger who wants social welfare and organizes the workers of a nation against the establishment? Right wing populism in the socialist form (or is that socialism in the right wing populist form? ), AKA right wing socialism. It is semantics, but it’s a label that fits like a glove. In sum to both your comments: Your stance seems to be “everything I don’t like in modern terms is leftwing, but since I like the stance of the classical left, that was right-wing.” I think we can just safely say history is what it is, but you don’t identify as a modern liberal. I get that. This is why I think we are better off breaking things down with more nuance. We have ideologies like classical left, classical right, social left, social right. Then we can go issue by issue and denote the flavor of a stance of a person or party and paint a complete and accurate picture. Almost all the modern forms are mixes of these things, so we can simply denote them by one term like social left or social right, or we can be more nuanced. It is not helpful to say “all socialists are leftwing” as it is underwhelming when we get someone like Hitler who is right wing in every sense except in terms of social policies for nationals. Meanwhile “Michael Foley” is confusing social democracies with socialism and saying Nordic countries adopt SOCIALISM. Wow, man! I know USA’s educational system is know as being very bad, but how bad can it get? The more I read from USA’s students, the more I suffer from their crass mistakes. Where to begin with your BS? First off, the only ‘liberty’ that capitalism requires is that of a privileged minority to monopolise control over essential resources and exploit others for profit. This is also the only ‘liberty’ that property rights are a necessary precondition for, at least if you’re talking about private property rights. Secondly, your characterisation of the far left as favouring state ownership of everything is belied by the existence of anarcho-communism, anarcho-collectivism and libertarian currents within Marxism (e.g. council communism). These schools of thought advocate common ownership of the means of production (i.e. the means of production being held not by any state – they don’t even believe that there should be a state – but indivisibly in common by all members of a given community). Thirdly, and relatedly, your conception of left-right taxonomy, based solely on views regarding the proper scope of the state, is such asinine, simplistic, reductionist claptrap as to quite frankly not befit an adult of average intellectual capacity. Advocacy of an authoritarian government does not make fascists, theocrats or supporters of absolute monarchy left-wing, nor, conversely, does advocating the abolition of the state make anarchists right-wing. If you think otherwise, then, to put not too fine a point on it, you’re a slack-jawed simpleton who has no business discussing political ideology whatsoever. Gary Allen’s left/right paradigm sounded attractive to me after noticing that indeed extreems of isms all fall into the same category: dictatorial control by a few which in the case of modern left evolves into elitism anyway as far as my perception of things reaches. Meaning for one thing living the luxury life not according to the rules dictated unto their citizen. Then putting all these ultimate forms of isms, including Faraoism, into the far left as collectivisms — everyone one and the same idea in service of a same goal — and into the far right total anarchy wasn’t too much of a brainer to me. Limited governance somewhere on the right gave the novelty political spectrum the more credence. Today there is little doubt anymore that the current democratic form of government in the US since decades is done and over with. There is the illusion of presidential leadership since say the exponential expantion of the military industrial complex which is simply identifiable by its exponentially growing budget and how the last 2 centuries universities have become participants in it and even the emergence of liberal hawks. That way the modern left/right paradigm has morphed into a duopoly, both joined at the hip by equal geopolitical and monetary interests. Revolving doors are a tell tale but so do the numerous think tanks further corrupting the system and using the left/right ideas people have merely as an instrument into making them believe there is democracy, the illusion of citizen participation. A few domestic measures as promissed during election talks by ‘their president’ reinforces that delusional idea. Continuation of governance when it comes to foreign policy and hegemony with its war mongering makes for the world this left/right paradigm in the US totally irrelevent. This makes the stance of pointing to the agitators on both ‘left’ and ‘right’ and ending of everything that feeds wars and oppression of nations that do not abide to the Anglosaxon demands the best choice for everyone to begin with. The revisionist history is quite easy to clear up. Read Hitler’s biography, Mein Kampf (My Struggle). It will take you about 5 minutes to realize the entire book is all about blaming all of Hitler’s (and Germany’s) problems on Jews and Communists. Exactly. Those left-wing Russian Communists. Stalin. It’s simple. Stalin and the left-wing Russians defeated Hitler and the right-wing Nazis in WWII. They’re ideologically speaking mortal enemies. Not sure how people get so confused (I’m being facetious here. We all know how people get confused about this. Revisionist historians lie to us. On purpose). It’s from the NYTimes in 1922, long before the revisionist historians began purposely making things backwards to befuddle the feebleminded. The article plainly describes how Hitler’s “National Socialist party” had nothing to do with socialists. How they beat socialists over the head with black jacks, etc. To be blunt, Hitler and the Nazis were not socialists. They exterminated socialists. In their concentration camps. They wore red badges until they were gassed and put into the ovens, just as Jews were, and in about the same numbers. You can name Nazis “National Socialists,” just like you can name your dog “C-A-T.’ However, your dog is still a dog, and Nazis are still right-wing authoritarian fascists. The ones of old, as well as the so-called “alt-right” neo-Nazis white supremacists of today’s American white supremacy movement are all right-wing. The bottom line is looking at the original sources is a lot different than listening to Rush Limbaugh turn your brain into Spaghetti-Os. Yeah the thing that I think people miss is that the NAZIs were socialists, but they were right wing socialists who differ greatly from progressive left wingers, AND from liberals, AND from Communists. They disliked liberals, capitalists, most other socialists (especially communists), and conservatives. They were a militant nationalist socialist party fixated on the folk state, a pure race, and pushing back against the globalists and bankers after WW1. This was what we today call right wing populism in an extreme form, it was a right wing evolution of socialism (so a left AND right mix), a type of fascism. If someone is trying to equate them with Bernie Sanders in every way and is ignoring their right wing qualities, from that standpoint we can say “hey, back up buddy, you have this wrong; taking guns from the Jews is not exactly the same as background checks for AR-15s.” However, if someone is truly discussing their socialist qualities, they are hardly wrong to call this right wing German workers party socialist. They were, socialists of a type and they literally had many socialist policies for pure blooded German nationals. Then again, I think we can point to modern right wing populist movements and discuss the ways in which they are socialist too. The nationalist sentiment and militarism, that is often found on the right. The desire for healthcare for all, often found on the left. That focus on workers over elites, that is found in the left and right populist movements. Ultra nationalist, ultra socialist, and populist. Is it scary that we can find aspects of the NAZIs in both the left and right of today? I don’t think so, humans are humans. We need to keep in check the desire for extremes, a little bit of nationalism and socialism are good, let it get too far out of hand, and you start getting WW2 Communists and Fascists (TIP: the lessons learned from Communism are not the same as fascism, this page is about fascists, not Communists; in that conversation the left is a little more to blame, just like the right a bit more in this one). The lessons in the story can only be learned if you look closely to learn instead of overly focusing on mud flinging. TOTALITARIAN, SOCIALISM/COMMUNISM, BIG GOV’T IS LEFT. ANARCHY, REPUBLICANISM, SMALL GOV’T IS RIGHT. IT IS ALL IN THE SIZE OF THE GOV’T.